This year’s eagerly awaited Christmas Celebration Concert will take place on Saturday the 12th of December in St Begh’s’ Church, Coach Road, Whitehaven commencing at 7:30pm. Proceeds from the concert will be donated to the North and West Cumbria branch of The Motor Neurone Disease Association, in memory of the choir’s founding Musical Director, the late Baxter Shaw. Baxter passed away in 2005, having suffered from Motor Neurone Disease. This year the Choir has a special guest soloist, one of Baxter’s former pupils Kerryann Wilson. Twenty year old Kerryann Wilson was born in Whitehaven and educated at Whitehaven secondary school through to sixth form. Her passion for performing arts began at the early age of three with a local dance school. At the age of six, Kerryann decided to study singing with the late Baxter Shaw and was trained by Baxter until the age of fourteen when unfortunately he passed away. Baxter was a true perfectionist and a close personal friend who always believed in Kerryann and wanted her to pursue a career in singing. She then trained with well known soprano, Patricia Pictor and is currently studying with Dorothy Edger, who also taught her the basics of piano. She has competed in many local and regional music festivals from a young age, winning numerous classes and bursaries to further her singing tuition. At Whitehaven music festival she won the Junior Rosebowl in three consecutive years, then upon advancing into the adult categories immediately won the Alfred Swinburne Memorial Rosebowl, which she won again this year. She has participated in local theatrical productions with Whitehaven Theatre group and at Whitehaven School. She also sang at the school’s annual sell out Blue’s Night, and in musical productions of ‘42nd Street’ and ‘Little Shop of Horrors’, taking leading roles in both. Kerryann has helped raise money for numerous charities, most recently at Rosehill Theatre for their 50thanniversary celebrations raising funds for the running of the theatre, and also at Workington’s Carnegie Theatre ‘You’ll Never Walk Alone Concert’ in aid of the West Cumbria Society for the Blind. 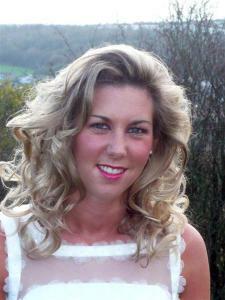 Kerryann has also sung at many wedding events in churches and intimate venues throughout Cumbria. She is currently studying English Language and Literature at Lancaster University and hopes to train as a teacher in the next academic year. In the future she hopes to study at the Royal Northern College of Music, and follow her passion in life further and achieve a career in singing. Sethera Brass will also be performing in the concert. Tickets priced at £6.00 and (£5.00 concessions) are available from any choir member or via telephone from Don Messenger (Secretary) on 01946 63452. It ranged from the shear majestic sound of the Bands playing Procession to the Minster to the opposite end of the spectrum when the Male Voice Choirs sang so beautifully and with great feeling “Night” by Schubert. The Ladies Choir were a real delight and gave excellent rendering of My Guy, Cross the Wide Missouri and Lift Thine Eyes to the Mountains. Two of the Male Voice Choir’s greatest songs, Pilgrims Chorus by Wagner and Love, Could I only Tell Thee by J.M.Capel were greeted with rapturous applause from the capacity audience. Among the Bands numbers were Colonel Bogey, Clog Dance, Cornet Carillon and Finale, Symphony No.3 with the majestic sound of the Organ which received a standing ovation. As the Royal Albert Hall faded into darkness, the audience and Choirs illuminated a lapel Twinkler, the choirs and bands then sang and played “Deep Harmony” in memory of family and friends who have died or effected through cancer. I write this with a tear in my eye as I recapture that moment of emotion. The Evening drew to a close with the wonderful sight and sound as the Choirs, Bands and Audience Joined in flag waving and singing with great gusto Land of Hope and Glory. 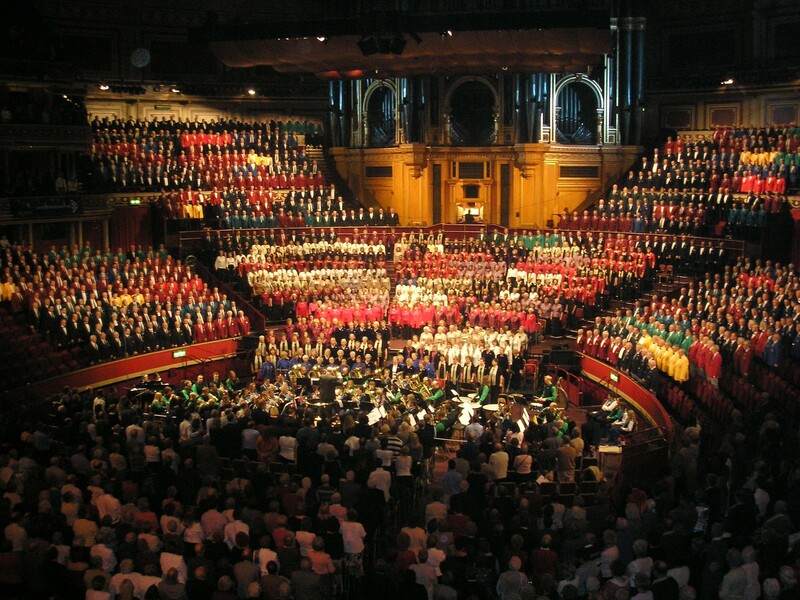 Friday October 30th sees seventy five choristers, family, friends and supporters setting off on the three hundred plus mile journey to London for the weekend, to sing in The Festival of Brass and Voices held at The Royal Albert Hall. 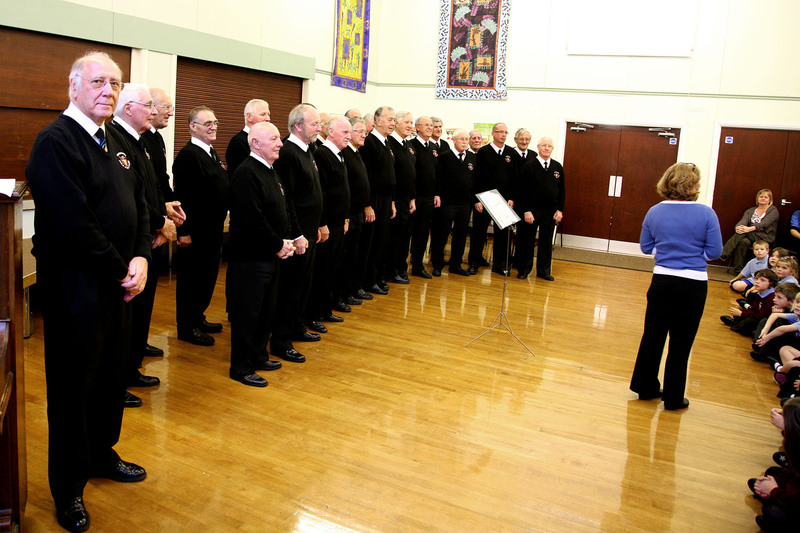 This is the fourth time Whitehaven Male Voice Choir have performed at the tri-annual concert, which raises much needed funds for Cancer Research UK. 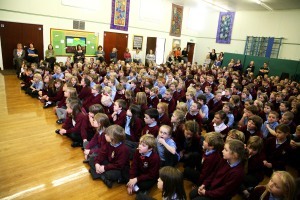 In 2006 the concert raised a staggering £95,000. The concert formely known as The Yorkshire Festival of Music, features 1500 male and female choristers from all over the United Kingdom along with two of the UK’s finest brass bands; Brighouse and Rastrick, who are well remembered for their chart-topping record ‘The Floral Dance’ and Grimethorpe Colliery, made famous by the film ‘Brassed Off’. The choirs and bands will perform many well known pieces, such as Mozart’s Gloria, Love Could I Only Tell Thee, Deep Harmony, Anvil Chorus, Rule Britannia and many more. The Musical Director for the event is William Relton, former general manager of the BBC Symphony Orchestra. Before travelling home on the Sunday the choirs will also gather to sing for the general public at Covent Garden. Every year the Choir’s committee nominate a local charity to be the beneficiary of the Christmas Celebration Concert and fundraising sing in Whitehaven’s Tesco superstore. The nominated charity for 2009 is The North and West Cumbria branch of The Motor Neurone Disease Association. This charity has been chosen in memory of the late Baxter Shaw, the choir’s founding musical director who passed away in 2005, having suffered from Motor Neurone Disease. Visit: MND North and West Cumbria for more information. 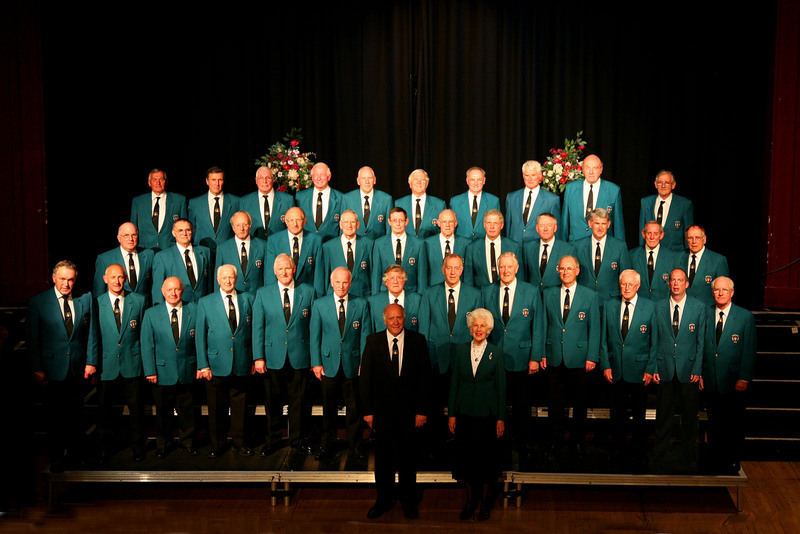 On Saturday June 13th 2009 Whitehaven Male Voice Choir perform their eagerly awaited Annual Concert in the town’s Civic Hall, commencing at 7:00pm. This year’s guest artists are The Gibside Singers. The Gibside Singers are a female choir, with a membership drawn from a wide area, covering County Durham, Newcastle, Gateshead and Northumberland. The choir, named by permission of the late Queen Mother and the late Earl of Strathmore (who gave permission to use the family crest dating from 1767), is one of the North East region’s most successful and popular choirs. The choir have a busy concert schedule throughout the North East and enjoy choral exchanges, which have taken them to Yorkshire and Lancashire. The choir were privileged to sing for HRH Prince Charles when he visited Gibside Chapel, and to sing at ‘The Festival of Brass and Voices’ in The Royal Albert Hall in 2003 and 2006 in aid of Cancer Research UK. They look forward to a further performance there in October of this year. A memorable occasion was to sing with the ‘People’s Tenor’ Russell Watson, in Newcastle and Glasgow Arenas. The choir’s musical repertoire is extensive and covers all styles from traditional folk to musicals, opera, classical, sacred and a sprinkling of pop. They welcome the challenge of competition, and have won many first prizes. The choir perform in support of local humane charities. The choir is a member of the National Association of Choirs, Their Musical Director, Doris Williams, a well known North East musician, is a Vice-President and Music consultant for the National Association of Choirs, Chairman of the North East Group and also directs the Newcastle Male Chorus. Their accompanist David Scott, an experienced and talented musician, is principal organist at Brunswick Methodist Church, Newcastle and accompanist for Newcastle Male Chorus. Tickets priced at £7 and £6 (concessions) can be reserved by telephoning Don Messenger on 01946 63452. Whitehaven Male Voice Choir were on their travels again last weekend, this time to Stanley, in County Durham, where they were the guests of the Gibside Singers, at their annual concert. 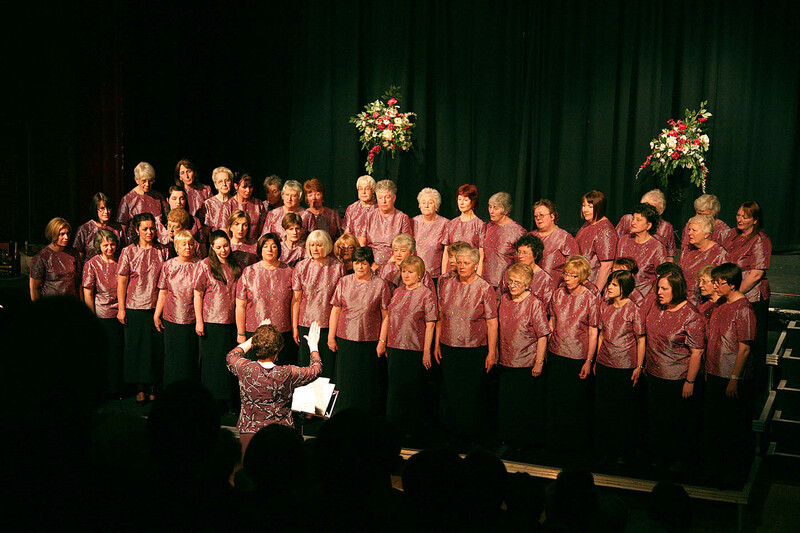 The Gibside Singers are a ladies chorus under the direction of the Vice President of the National Association of Choirs, Doris Williams. Ms Williams is also Honorary Music and Festival consultant to the National Association. Their accompanist, David Scott, was previously in Whitehaven in 2005 when he accompanied the Northern Male Voice Choirs at a massed concert in Whitehaven’s sports centre organised and hosted by Whitehaven Male Voice Choir. The choir recently achieved a first in the Ladies Choir section of the Ryton festival. They have a wide repertoire of music and put on a very polished and professional performance, matched equally by our own songsters on the night. It was a superb concert and well worth the travelling to be there. The Gibside Singers are to be the guests of Whitehaven Male Voice Choir at their annual concert in the Civic Hall on June 13th. The Choir have now completed another highly successful year – 2008. They have performed at nineteen concerts/events raising £6,742 for various local and national charities and other worthy causes. With an ever increasing membership, currently standing at forty-three, the choir can look forward to the prospect of many more years of song. On January 8th 2009 the choir will welcome back their Musical Director Hugh Robinson following his recovery from illness. The choir are extremely grateful to David Proud who directed them for the majority of 2008. In 2009 the choir have another busy concert diary, and are looking forward to travelling to The North East in April as guests of The Gibside Singers. 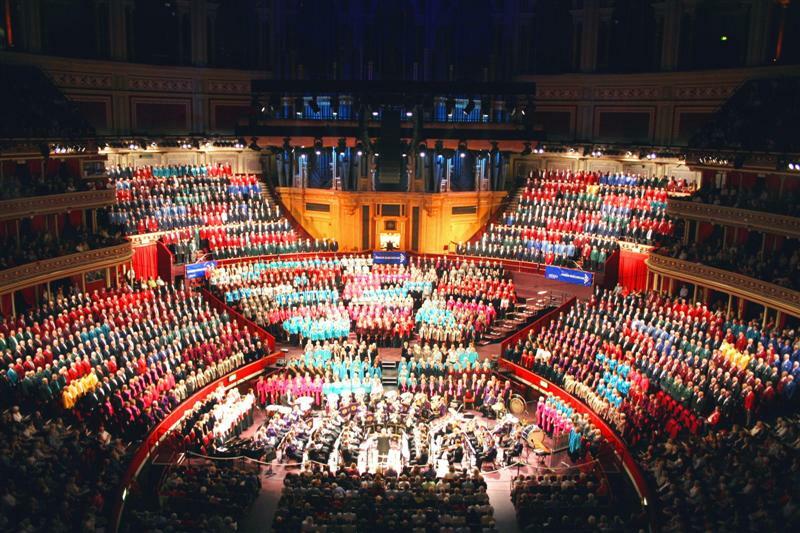 October also sees their fourth visit to sing in The Royal Albert Hall, London as part of The Festival of Brass and Voices; raising much needed funds for Cancer Research UK. 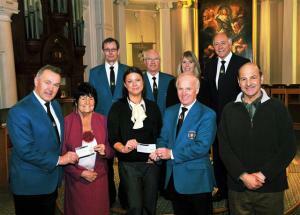 In January 2009 the Choir presented cheques totaling £1328 to local charities West Cumbria Society for the Blind and The Michael Kennett Cancer Treatment Fund. 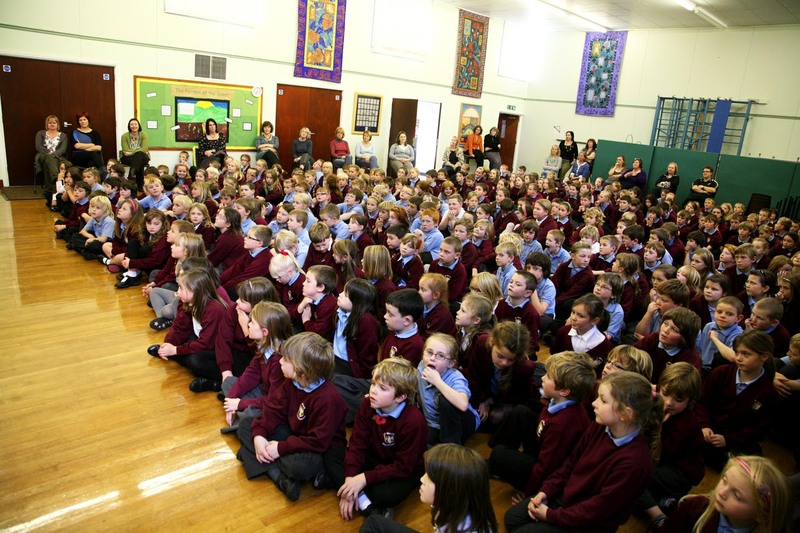 This money was from the proceeds of the Christmas Celebration Concert and singing in Tesco. This is only a small part of the money raised every year for charities throughout Cumbria. Front Row L to R: Billy King (Chairman), Marie Scott (West Cumbria Society for the Blind), Leanne Graham (Michael Kennett Cancer Treatment Fund), Don Messenger (Secretary), Michael Kennett.